When John Burke came to Passage East National School as Principal in 1970 he soon became immersed in hurling. For many years he worked tirelessly at promoting under age hurling in the school and ultimately at the local hurling club. He was actively involved in Scor and introduced many local boys and girls to the event. He recalls some of his early experiences in ‘A History of Passage Hurling Club through the Dec- ades’. Produced to celebrate the Golden Jubilee of Passage Hurling Club, John attended the launch in January 2011 by Micheal O‘Muircheartaigh at the Woodlands Hotel. In January 2009, Noel Connors, a past pupil of the school made his first senior appearance for Waterford against UCC in Ardmore. Later that year he was nominated for an All Star Award. With some excellent performances in the number four jersey 2010 was a rather special one. He won his first Munster Senior Hurling Medal, was voted Waterford Senior Hurler of the Year and selected on the GPA Team of the year. Later that year he was awarded an All Star. Just turned 21, Noel is fast becoming one of the finest hurlers in the game. In a recent interview he attributes playing hurling akin to study and exam success-what you put in you get out. The emergence of De La Salle in Colleges Hurling at Munster and Nation- al level involved many of our past pupils who have won Dr Harty Cup and Dr Croke medals. Hurling continues to thrive in Passage where a second juvenile pitch and flood lit Astro Turf facility were just completed. 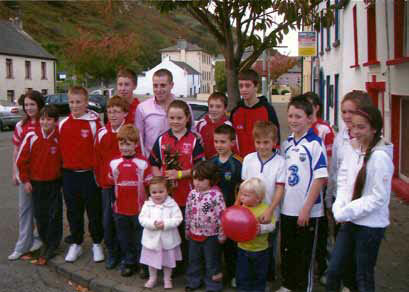 Players from five years upwards now line out in the club colours as the population locally increases. Close links exist between the school and the hurling club who this year enlisted the services of former Waterford defender Sean ‘The Rock’ Cullinane to deliver a schools programme.